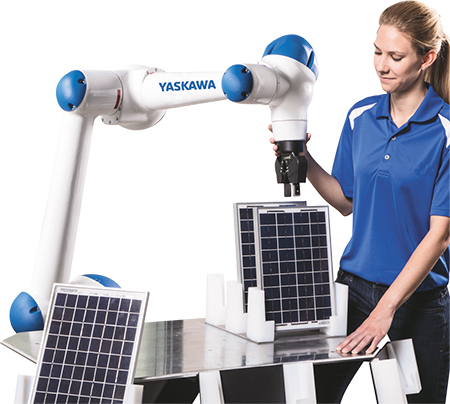 The new six-axis HC10 collaborative robot from Yaskawa Motoman, Dayton, OH, works safely with, or in close proximity to humans, as the robot will stop in the event of contact with an operator. Dual torque sensors in all joints constantly monitor force to quickly react to contact; something typically only found in more expensive systems, according to company officials. It is designed to eliminate operator pinch points while through-arm utilities hide cabling and increase safety by reducing the risks of snagging or interference with other equipment. In addition to traditional robot programming through a teach pendant, users can hand-guide the HC10 robot when teaching new program paths. This feature allows the robot to be quickly deployed or redeployed on demand, decreasing system downtime and increasing return on investment. Whether operating at full or collaborative speed, cycle times are optimized based upon risk assessments and process requirements. The highly configurable HC10 offers a 10-kg payload and 1200-mm reach, and can perform a range of material-handling, machine-tending, packaging or light-assembly tasks.